Private College Week is around the corner! We want your help in letting students know about this great opportunity to visit Indiana's private colleges and universities. And have you heard about 21st Century Scholars Day on July 19? 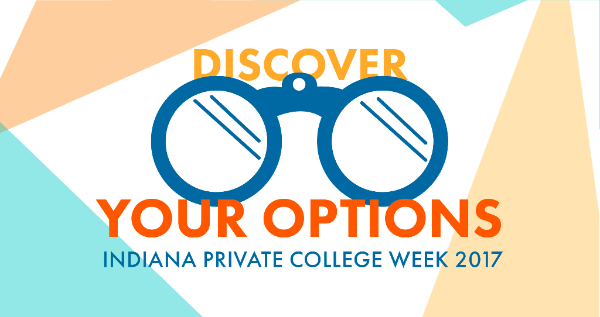 Private College Week is a designated time for students and their families to visit any of Indiana's private, nonprofit colleges and universities for free tours and activities. It takes place July 17 - 21, and you can click here to see the schedule. Students will need to contact the schools directly to schedule their visits. And new this year is 21st Century Scholars Day on July 19! This is a day specially designed to help students complete their Scholar Success Program. Most of our schools will be offering opportunities for students to do some of the required activities, such as "Estimate the Costs of College," "Search for Scholarships," and "Submit Your College Application," and several will have representatives from the Commission for Higher Education on-hand to help students log the activities. We are very excited about this event and hope many students will take advantage! Check out the schedule to see which schools are participating, and let students know to contact the schools to set up their visits. And finally, I have put together a media kit for you to use to let your students know about Private College Week and 21st Century Scholars Day. It includes graphics and pre-written posts for social media, including tweets and Instagram captions. Please feel free to personalize and share these on your guidance office social media accounts or personal accounts! You can view and/or download the media kit by clicking here. Thanks for your help in spreading the word! As always, please feel free to contact me if you have any questions. Learn more about Private College Week!